Theatre on shelf - that moment when you see a product, fall in love, and buy it. Packaging designers often talk about ‘theatre on shelf.’ It’s what we strive for with every design range that we create. But what do we actually mean by it, and why should you as a small business owner selling products care? 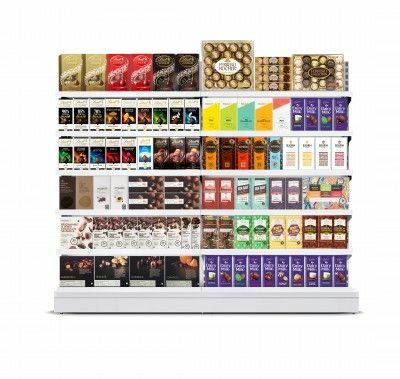 In a nutshell, ‘theatre on shelf’ is that golden moment when a consumer first sees your product range on a supermarket or in-store shelf. While the design on its own may be lovely, as a range on the shelf it will be striking and compel the shopper to take a closer look. They’ll want to touch what your selling, examine it from all angels, read the brand story, and check out the ingredients (if there are any). If they like what they see, they’ll buy it. And this is what packaging design is all about – it’s capturing the consumers’ attention long enough to entice them to take a second look. And this is so important because most consumers make their decision to purchase a product in 4 seconds. If your goods get lost in the ‘theatre’ you lose the opportunity for a sale. For Honest Chocolate, I used a simple design that creates an interesting geometric shape when put together. This is the theatre on shelf. It’s easier for established brands to win on shelf because they have the advantage of time on their side. What I mean by this is, it’s a product that consumers have probably grown up with, and they already know and trust it. So they’re more likely to look for it on a shelf and buy it. Price doesn’t often factor into their purchasing decision because they know what they’re getting. There are no hidden surprises, and more importantly no feelings of disappointment. As a new brand, your goal should be to disrupt the shoppers&apos; pattern. You want your product to stand out on the shelf and say, “hey, look at me. Yes, I’m new, but you’re going to love me, and you need to buy me.” Achieving this leads me to my next point. 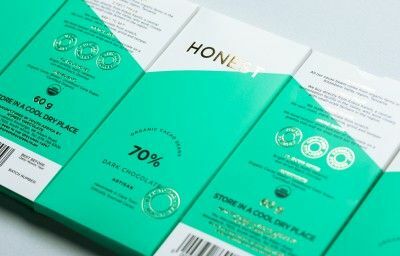 An example of what Honest Chocolates would look like on shelf, and competing brands. No designer should ever create packaging designs without understanding the space in which your product will be competing. This is packaging suicide. The last thing you need is to have a beautifully designed range of products that get lost on the shelf because it uses similar colours to many of the other brands. What I like to do is to research the spaces in which my client’s product will live. I take pictures of the store shelves to get a real sense of the colours, imagery, and positioning of competing products. And I do this before I start conceptualising a design look and feel. Makes sense, right? Standing out on the shelf requires looking different to your competitors. It could be that you use tin in favour of cardboard, or a cylindrical shaped-package instead of cubed. If every other brand uses visuals, you might want to use illustrations, beautiful typography or a striking stamp, and this all needs to be communicated to your client in the design presentation. You need to explain why you’ve chosen a particular look and feel, and back it up with 3D renderings of what the finished product will look like on the shelf. This will help your cause, and it’ll also give your client a relatively accurate picture of what their product is going to look like in-store. For Pharmacy at Spar&apos;s range of condoms, I placed a silver strip in exactly the same place on each pack to create theatre. More and more consumers are purchasing reusable or recyclable packaging. They are environmentally conscious, and they want to know how your product is made if it’s good for them, and the environment. Cost plays a significant role in determining the types of packaging that we use in South Africa, but I am hopeful that soon more clients will be open to use recyclable packaging. Trends change and what was in vogue one year isn’t the next. The key with packaging design is to draw inspiration from trends that won’t date, at least not quickly. You need to think about the type of consumer that you want to attract. Will cute illustrations grab their attention or are they more susceptible to something sleek looking? In closing, ‘theatre on shelf’ is packaging that advertises itself. It’s clean, honest and stands out from all the clutter, noise, and colour on shelves in shops. It doesn’t necessarily need to be an award-winning design. 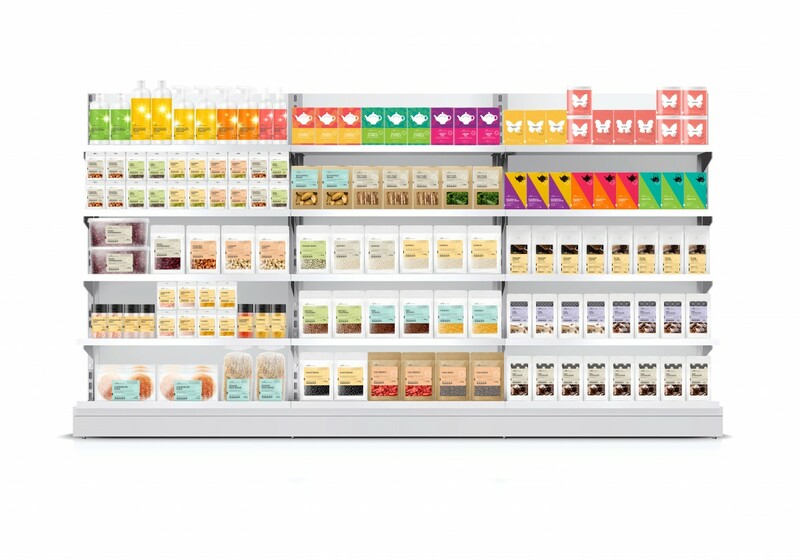 Sometimes the positioning of a logo or the inclusion of a single strip of colour can create theatre when the entire range of products are placed on the shelf. Remember, to create unforgettable packaging you need to have studied the space in which your items will live and know the type of consumer that you’re appealing to. Good luck.